While one of the benefits of owning a truck is the ability to haul gear both big and small, sometimes you need to know that your goods are protected. One of the fastest, easiest, and most effective way to keep items in the bed of your truck dry and safe is to have Line-X Inland Northwest in Spokane and Coeur d’Alene install a tonneau cover on your truck. Tonneau covers are available in a number of materials, sizes, and colors to ensure a tight, secure fit. Our expert technicians can install your bed cover quickly so you can stop worrying about what is in your truck. At Line-X Inland Northwest, we carry a large selection of high-quality truck accessories, including tonneau covers. In addition to being your best source for high quality parts and accessories, we are also an authorized Line-X installer. At both of our locations, you will find a friendly, expert staff that is always ready to help you. 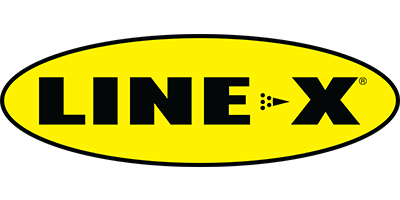 Give us a call or stop by either of our locations for a free quote on the Line-X bed liners and truck accessories that you want! 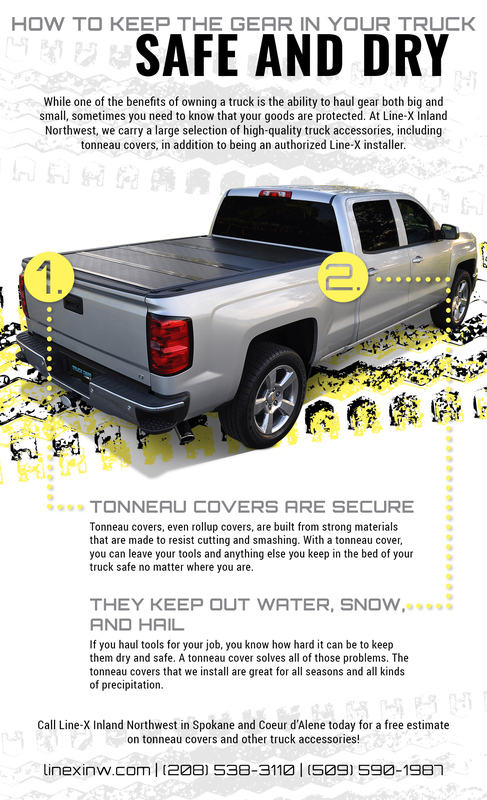 Read on to learn more about tonneau covers and why they might be perfect for your truck. Tonneau covers, even the soft, rollup versions, are built from strong materials that are made to resist cutting and smashing. With a tonneau cover, you can leave your tools and anything else you keep in the bed of your truck safe no matter where you are. Almost all tonneau covers lock, which gives you another layer of security. One of the most effective ways that these bed covers prevent theft is by acting as a simple deterrent. Thieves don’t want to have to spend any more time than they need to when they are trying to steal something, and a bed cover presents a barrier that makes it too risky. If you haul tools for your job, you know how hard it can be to keep them dry and safe, especially with the weather that we have to deal with all year long. A tonneau cover solves all of those problems in one simple package. The tonneau covers that we install are great for all seasons and all kinds of precipitation and, because they cover the entire bed, they offer you a lot more storage space than a traditional toolbox. Call Line-X Inland Northwest in Spokane and Coeur d’Alene today for a free estimate on tonneau covers and other truck accessories! We are proud to serve this area and all of the hard-earned truck owners who live here. There is nothing that we won’t do to ensure that you leave our shop happy with your purchase. Find the floor mats, grille guards, nerf bars, and everything else that will make driving your truck easier and more fun at either of our locations. If you have questions, please reach out. We would love to discuss options! ©2018 LINE-X Inland Northwest - Do not copy. All rights reserved.